I've had a lot of request for a black Santa, I love how he came out. 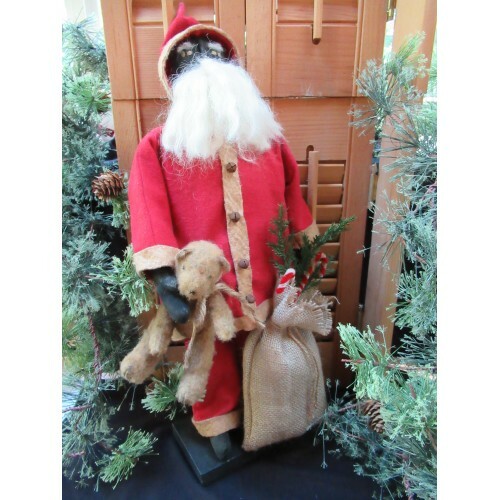 This Santa stands approximately 18 1/2" on a wooden base. He wears an "aged" red flannel suit trimmed with coffee stained warm and natural. His boots, hands and head are muslin that has been painted black. Rusty bells are used for buttons. 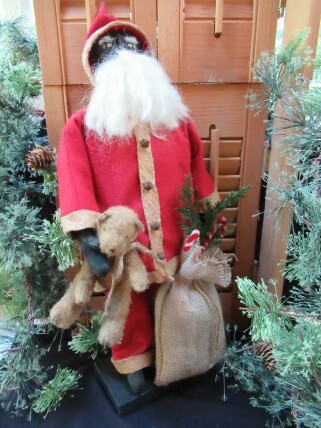 His sack is made from stained burlap it holds greens and chenille candy canes. The little teddy bear is made from plush felt and painted/stained to look worn. A piece of jute is tied around his neck.